Watch the video and see for yourself how our products can make playing windy outdoor gigs and concerts more enjoyable. Anyone who has performed outside when it’s windy knows what a distraction it can be to keep sheet music from blowing off the stand. The Musicmaide Stand Clip and Portfolio are simple, hassle-free solutions to this problem. Our demonstration video shows how our products will secure your sheet music and books against the most persistent breezes while still allowing for very fast song transitions and easier page turns. We gladly ship to military bases, schools, and colleges. Our products are also available at Amazon. 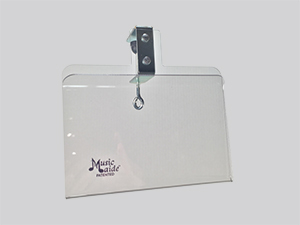 Our clip-on plastic sheet music holder wind clips are simply the best way to keep your music from blowing away while performing an outdoor concert. 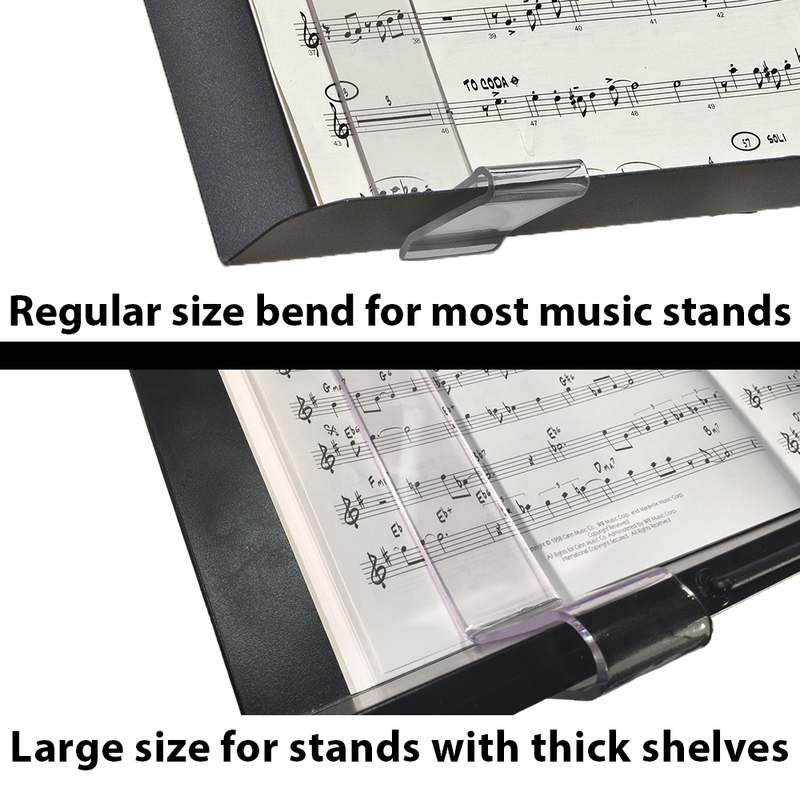 The transparent music holders slide onto the shelf of your music stand securing your music while still allowing for fast song transitions and easier page turns than with any other music holding device. Hidden from your audience, they look much more professional than clothespin-type wind clips. Fits all music stands including, Manhasset, Wenger, Hamilton, K&M, and many others. They even work on band stand fronts. The standard wind clip will work on any shelf thickness up to ½ inch thick. Order large bend clips for stands with a shelf thickness of more than ½ inch, such as the Peak music stand. 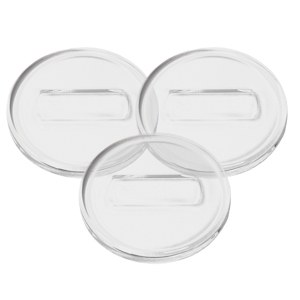 Our see-through wind clips are made out of a special, durable, break resistant plastic that won't crack or break when dropped like acrylic or plexiglass. They are also much easier to carry than large, heavy sheets of plastic. Carrying bags: Protect your wind clips and keep them together with one of our carrying bags. Note: The Standmaide Portfolio may be a better solution for pianos and keyboards that do not have a ledge to attach the clips. 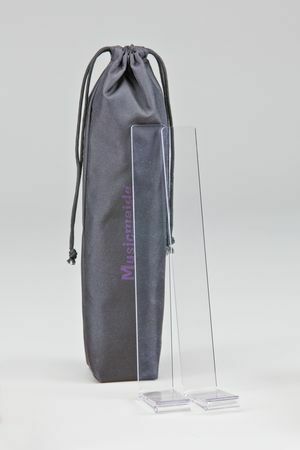 A pair of Musicmaide Music Stand Wind Clip with a carrying bag. 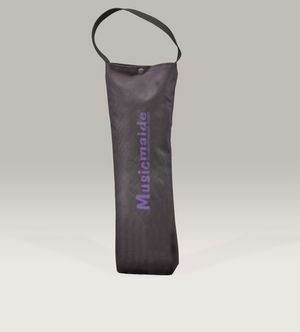 This lined canvas bag will hold up to 12 pairs of Musicmaide® Music Stand Clips. It also works great for carrying an instrument stand, drumsticks or other such equipment. Nowhere to put your playlist or other notes? Our handy Note Holder easily slides onto the shelf of your music stand. Just slide your program or gig list neatly into the holder and your list can remain visible at all times while looking professional. Our new clip design now fits all music stands including the Peak Portable. In addition to keeping your music from blowing off your stand, the Portfolio has a built-in handle and is capable of holding up to 40 sheets of music. Order adapters sold below if you have more than 40 sheets or a thicker book to secure. The attached elastic cord keeps the Portfolio from blowing off the stand and the adjustable sliding/tilting transparent plastic music clips keep your music from blowing away. Great solution for piano and keyboard players. Two units can be set side-by-side to hold 4 pages. Works great on folding wire stands providing extra stability and a backboard for a wind break, but can also be used on any other type of music stand. 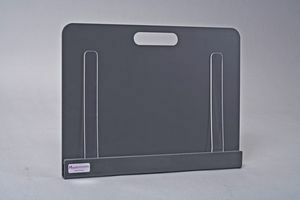 The Musicmaide® Sheet Music Holder Portfolio offers the convenience of very fast song transitions and easy page turns all while holding your music securely on any music stand. Multi-page and oversized orchestra sheets easily slide through the clips. 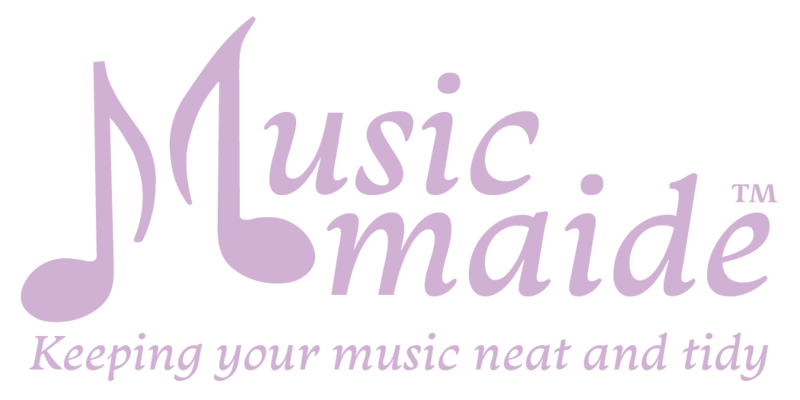 The Portfolio provides a convenient way to organize your music before your concert. With its built-in handle, it can be easily carried onto the stage preloaded with all your music secured and ready to go. Thick Book Adapters: Optional adapters for our Sheet Music Holder Portfolio provide extra space if you have more than 40 sheets of music, a 3 ring binder, or a thicker book to secure. Just remove the standard Portfolio clips and slide in the Portfolio Adapters. With the adapters in the Sheet Music Holder Portfolio, you can secure stacks of music or books up to one inch thick (that’s a 400 page book!). Carrying bag: Protect your Portfolio with the clip-on Portfolio Bag sold below. The Portfolio is much more professional looking than clothespins, much lighter and easier to use than heavy sheets of plexiglass and will not crack or break when dropped. 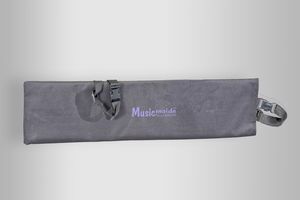 This handy canvas bag opens on the end with adjustable straps that clip onto most instrument case handles freeing up your hands. Perfectly sized to hold a folding music stand or most instrument stands. Bag can be loaded and unloaded without having to remove it from your instrument case.